Wow-have you been watching the Chilean miner rescue? Incredible! Daughter2 is coming home this evening and I'm a teensy bit excited. I'm making her favorite dinner (chicken divan) and will try hard not to overwhelm her with me. She's in school in the South and is in for a real treat with the colors of fall around here. The East Coast is definitely the place to be this time of year. 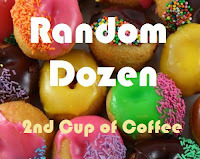 And, since today is Wednesday its time to play along with the Random Dozen. Don't let the fact that there is no #4 this week keep you from playing too....just answer the questions on your own blog then click on the donuts to link back to the whole big gang. 1. Is there a word which you initially mispronounced? Were the circumstances in which you made the faux pas embarrassing? I really can't think of one but I do know when I was a little girl I liked to use the word amn't which isn't really a word but was my own contracted form of am not. Pretty sure it drove my mom nuts. My oldest daughter used to say concreke in place of concrete. We thought it was oh so cute and never corrected her. Then one day she was in the car with a friend and used the word and the friend corrected her and they got into a heated debate about who was right and I had to fess up. She laughs about it now but on that day her ten year old self was not amused. I know. I waited a little long to correct but how many times do you actually use that word anyway? Some of its okay but I'm kind of a punctuation freak. It's hard for me to let go of the punctuation. I'm using more shortcuts all the time although I've been instructed by my kids to never use lol. In text or in real life conversation. Of texting in general I'm a huge fan. Call your young adult daughter and get no answer? Why, just send a text...you'll have an instant reply. 3. Tell me about your high school senior picture. Feel free to post. Well, there really is not much to tell except to say that my hair was uncharacteristically short. 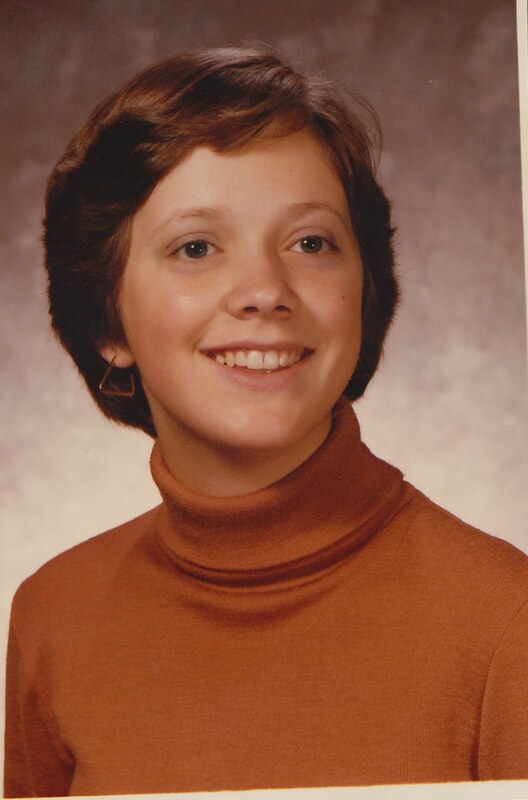 I always always had long hair, but in a fit of Dorothy Hamill wannabe- ness I cut it short my Junior year of high school. Coincidentally, it was right about the time our senior portraits were taken. I promptly grew it out again. When we first left uni we managed to get back for homecoming several times. Then life and distance happened. Last year my hubs fraternity was also celebrating an anniversary and we were bound and determined to get there. So many of our closest college friends made the effort too and I wrote about it here. Super fun! Almost too hard to choose-I love them both. I'm a morning person and often see the sunrise. I love the promise of a new day...love the quiet and the beauty and the stillness of early morning. That being said, a sunset on the water is probably one of my favorite things in this world. This was taken a few years ago on the back of our boat...the color of the sky looks absolutely painted. And I guess it was. Travel much more of this world. 8. Carol at Wanderings of the Elusive Mind ponders, 'If you could come back (in another life) as an animal, what would it be?" This one's a no-brainer...a dog. 9. Joyce (that's me) asks, "Where were you 10 years ago?" Please feel free to elaborate more than just your physical location. 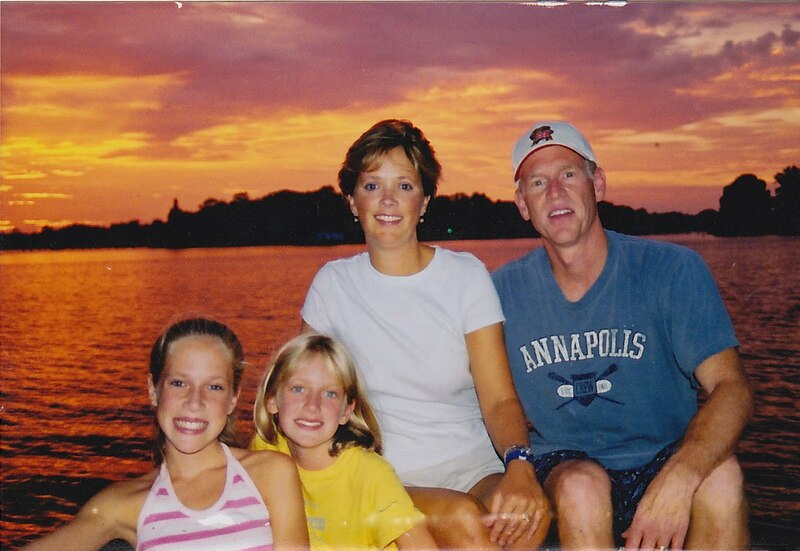 We were living in Maryland (Annapolis area) and my girlies were in the fifth and seventh grades. 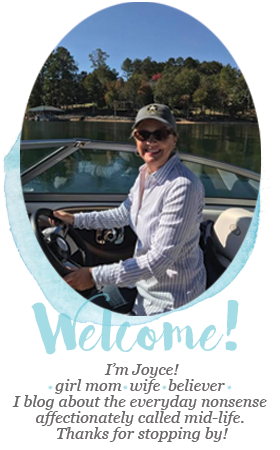 I was working as the Director of a lovely little school and loved my job, our house, our boat, our neighborhood, our church and our life. I didn't think I needed shaking up or waking up but God in His infinite wisdom knows best and three years later we kissed that life goodbye and moved to England. 10. When you are proven to be correct in any contentious situation do you gloat? 11. What is your favorite food which includes the ingredient "caramel"? I make an apple cake with a caramel glaze that is delicious. 12. 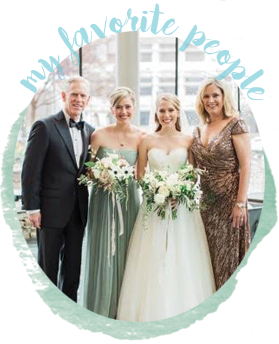 From Lid's seventeen year old daughter (who is cute and clever), "If you could be part of any fictional family, which family would you choose and why?" I mentioned here a few times that my favorite book ever is Anne of Green Gables. I'd like to be part of the Barry family...then Anne could be my best friend. I see in your old age you've gone back to Dorothy Hamill's short hair... it is very becoming on you! My eldest son used to say tata p'chips instead of potato chips. We didn't correct him for a long time either... it was just sO darned cute! Yes, I'm watching the Chilean miner rescue. And considering the purchase of waterPROOF mascara. Great answers, Joyce. And that sunset, how stunning! Loved #12, I would love my fictional bff to be Anne Shirley. What a beautiful family picture! Sunrises and sunsets... it's hard to pick. Yay for more time with your girlie! Have tons of fall fun! Oh my, but don't you sound like the sweetest lady?! As the mom of a new college student, I feel your longing for your daughter. Hugs. Love that Dorothy Hamill cut. I had one like it, only my hair was naturally curly and thick, so it didn't look too good on me. Thanks, Mom, for doing that to me. Loved your recounting of your life ten years ago. It sounds sooooo ideal!!! Ahhh...sometimes it is fun to ponder the past, eh? "Call your young adult daughter and get no answer? Why, just send a text...you'll have an instant reply." So true and THAT is why I text! Loved all your answers, and I wish I had thought of being part of the Barry Family so that I could be Anne's best friend! Anne of Green Gables was (and still is) one of my favorite books! Anyway ... Have a great visit with your daughter! When I was younger I used to say libary instead of library. Have a great dinner tonight! My son says lots of words wrong also that I don't correct! For point, he says poink. For Justin Beiber (lol.. its funny that my 6 yr old knows about this one), he says Justin Beaver. I think I'll wait awhile longer before I let him in on the correct pronunciation!! Oh I like you with the Dorothy Hamill haircut! Looks adorable! I have visited England three times and love it. The cake sounds fantastic....care to share the recipe? Sounds so yummy. Loved your younger pics....and the sunset pic looks like it is painted....how cool is that. You are so right about texting the daughters. A text is much faster answered than a call. Enjoy your dinner tonight. Loved reading your answers. Love the pictures you shared. We never appreciate what we have until it's gone so maybe we better really like who we are today to the fullest. Love the sunset picture! Unbelievably beautiful! I liked the Dorothy Hamill haircut and it looks great on you but my hair was too thin and fine for the style. Can't get over how much you looked like Dorothy Hamill. I think I had her hair cut during that time too. How funny! Loved your answer to #9, we just never know from day to day do we? I've just turned 40 and your list is scaring me! Although moving to England three years from now sounds fun. Love all your answers! I gave all my Barbies Dorthy Hamill hair cuts back in the day my mom was pissed! Hope you had a wonderful dinner with daughter #2! WOW what a decade can change!